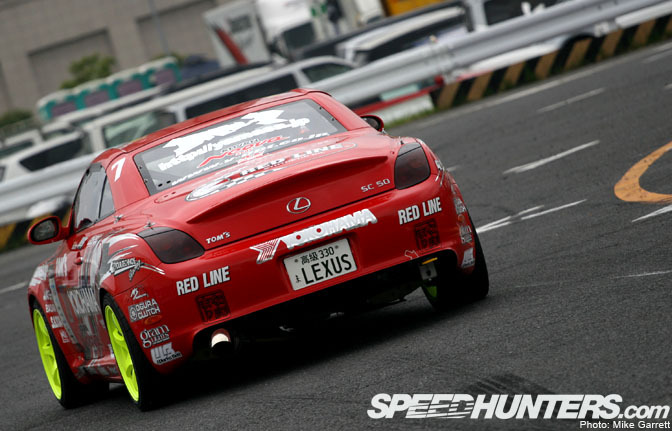 The Lexus SC430 is a platform that is not well loved by tuners. Despite the fact that it is used as Super GT machine, there are very few examples of tuned SC430’s in Japan or elsewhere. The few SC’s that are modified are usually done in mild VIP-like fashion. Back in January, there was an interesting-looking SC430 parked in the Ray’s Engineering booth. The car was painted flat black and had an interesting look to it. Word was that this SC430 would be the new competiion car for D1 driver Toshiki “Toshi-king” Yoshioka who had long been seen in the cockpit of an AE86. 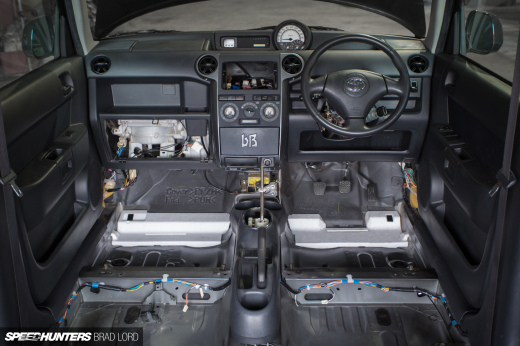 At the time there were very few details given on the new car and I assumed that it would be powered by the factory 4.3L V8 with a supercharger or turbocharger. It turns out I was totally wrong. 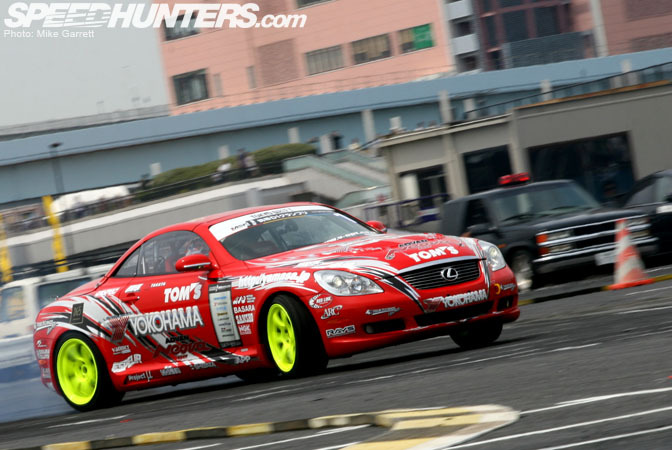 Nearly half a year later, the finished car finally debuted at last weekend’s D1GP exhibition match in Odaiba. Most people probably wouldn’t know it was the same car from TAS as the finish product ended up looking totally different. The first thing that grabs you about the car is its striking red paint and graphics work, which I think look great. On the exterior, the car is equipped with a complete Tom’s aero kit. While the kit itself is fairly subtle, in combination with the graphics and paint it has very aggressive look without being too over the top. I also find the car’s lack of a GT wing very interesting, especially given the power this thing is putting out (we’ll get to that in a moment). …but you will find a fire-breathing turbo 3SGE built by Prime Garage (who also did the engine work on Toshi-king’s 86). The engine is fed by an HKS 3240 turbine and cooled by a custom ARC V-mount intercooler. The piping and exhaust are also from Prime Garage. Power output ranges from 480-600hp depending on the boost level and whether the nitrous is being used or not. 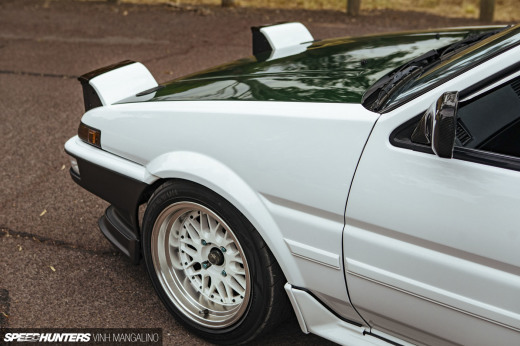 I guess Yoshioka really likes the gas since he used it in his old AE86. The engine is mated to a Super GT-spec 6-speed sequential transmission and power reaches the wheels through an ATS carbon LSD. The transmission makes a very distinct whining sound that I think might be louder than the exhaust itself! Here we see one of the mechanics working under the car between practice runs. Like most D1 cars, the suspension consists of DG-5 coilovers, and custom Espelir springs are also being used. The wheels are 18″x9.5″ (+12?) Gram Lights 57D painted in retina-burning “luminous yellow” finish. If the wheels haven’t blinded you, you can also see the Project Mu brake set up. Interestingly, the car is still equipped with the factory convertible roof. Luckily, Yoshioka is protected by a full roll cage and held in place by a Recaro bucket seat. The Odaiba event was a shakedown run for the new car and the team is still working to get it dialed in. It looked like it had all the power it needs, but it could use a little more drift angle. It will take a little while for Yoshioka to adjust to the bigger, more powerful Lexus after driving AE86’s for so long, but I’m sure we will be seeing big things from him in this new car. Thanks to Aspec/OG-made Logan for the low down on the car’s specs. 3SGTE's can take massive amounts of punishment and abuse. And am I alone in loving the wheel color choice? 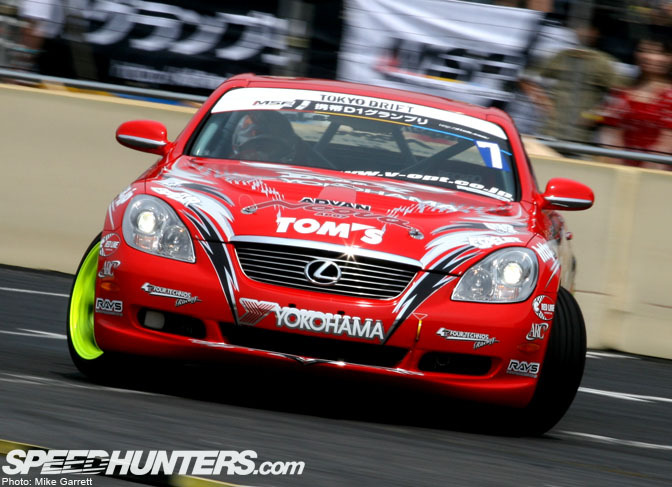 I've never been a fan of the SC430 (Latest gen of Soarer), but this looks tight. I think a GT wing would give it more look too. Needs a front lip, something to bring the front down lower. Not aggressive enough, but cool that they're using this car to drift. I like the color of the rims, but not when half the grid is rocking the same wheels. I really wonder how this car is gonna cope with the other high horsepower cars in the rest of the season. Yes excellent feature ive been waiting to see this one. Great Job! Awesome car!!!! 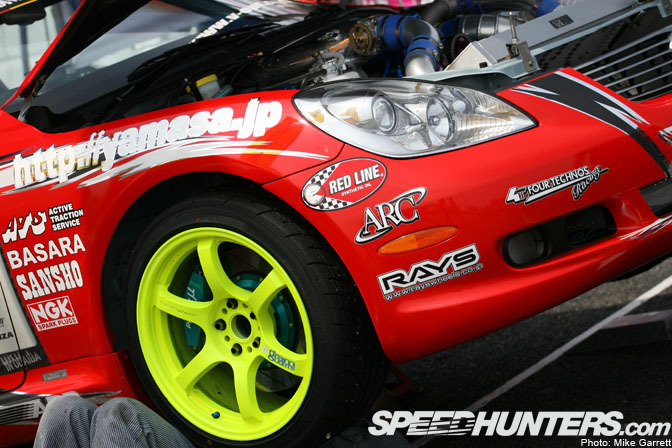 Nasty wheel color choice my opinion. Beautiful car! I like the subtlety of the bodykit w/o the GT spoiler. However I really think the chartreuse wheels don't help the looks of the car. Interesting engine choice! Great coverage as usual Mike....but an old news.....lol. wheels are actually a great idea, make sure the judges see his counter. never been a fan of this car at all but this ones is pretty nice. I like the wheels to but the color choice doesn't go with the paint job, maybe some crazy red would work better? I liked the engine choice. its putting out almost as much hp as a reliable 2jz. the 3sgte is strong but a lot lighter than the 2jz. this would help balance the car better. thats what i bet they were going for. Toyota made the same change in some of there racing car picking the 3sgte as there race engine. those wheels should be not be allowed on anything but the Wedsports cars!